The 2016 annual Royal College of General Practitioners (RCGP) conference took place in the historic spa town of Harrogate, 6th - 8th October 2016. With a theme of ‘Energising Primary Care’, this year's conference provided delegates with a packed agenda of plenary, concurrent and fringe sessions, a lively exhibition and an extensive selection of posters. Keele was well represented, with attendees including Professor Carolyn Chew-Graham, Professor Athula Sumathipala, four NIHR Academic Clinic Fellows (ACFs) and two Keele Medical students. Victoria Silverwood (NIHR Academic GP ST3) presented a poster on her topical audit, reviewing unplanned acute admissions to hospital in patients with long-term conditions which demonstrated that those patients on an Unplanned Admissions Register’ (UAR) were less likely to be admitted than those not on the register. 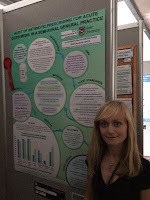 Her poster was awarded a rosette and shortlisted for a prize. Annabelle Machin (NIHR Academic GP ST4) presented two audits. The first reviewed the content of rheumatoid arthritis annual reviews performed in primary care, revealing assessments to be inconsistent and mood problems to be under-explored. She evidenced how the introduction of a template led to more holistic assessments. The second audit focused on adherence to antibiotic prescribing guidelines for acute otitis media in primary care, revealing that deferred prescriptions and self-care advice leaflets were under-utilised. The poster was awarded a rosette and shortlisted for a prize. Annabelle also presented a research poster, (with Carolyn Chew-Graham and Samantha Hider), reported patient perspectives on case-finding for anxiety and depression in patients with rheumatoid arthritis (RA) and highlighted the value of a nurse-led annual review clinic to assist early recognition and management of co-morbid anxiety and depression in people with RA. After being shortlisted, the poster was awarded the research category prize. Maatla Tshimologo (Keele University medical student), presented a qualitative analysis of perceptions of third sector workers supporting older people with depression. There were numerous inspirational plenary speakers. Kate Allatt gave a particularly emotive speech as she shared her inspirational story of recovering from locked-in syndrome. She called for GPs to not be dismissive of patients’ concerns, echoing the sentiment of NICE chairman Professor David Haslam, who presented his ideal consultation model, involving ‘shutting up, listening, caring and knowing something’! The session led by Roger Neighbour and Dr Waqar Ahmed was extremely well attended. Their humourous presentation on the use improvisational theatre techniques to deliver more effective consultations for GPs and their patients introduced new and thought-provoking concepts. Professors Carolyn Chew-Graham and Athula Sumathipala from iPCHS also led a session on the use of metaphors in the management of people with Medically Unexplained Symptoms (MUS). The workshop involved a discussion of the acceptability of these metaphors and how they could be used in consultations.